Hurricane Michael Intensifies Rapidly, Cat 4 Landfall Possible, Evacuations Ordered In FL Panhandle [VIDEO] - Joe.My.God. Hurricane Michael rapidly intensified on Monday between Mexico’s Yucatan Peninsula and Cuba, and is headed for Florida’s Big Bend region — likely coming ashore between Destin and Apalachicola on Wednesday — as a major Category 3 or 4 storm. Hurricane and storm surge warnings are now in effect for parts of Florida, with watches extending west into Alabama. This storm presents a particularly dangerous situation for the Sunshine State, since computer models and official forecasts have trended toward a stronger hurricane. The storm’s track means residents will have only a few days at most to prepare, and some may be caught unaware after a long holiday weekend. 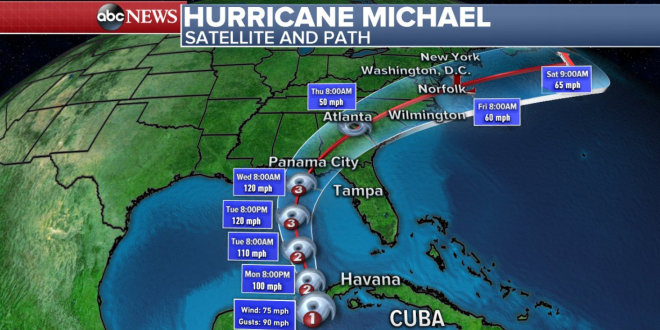 Michael’s large size, strong winds and heavy rains could produce hazardous flooding along a stretch of Florida’s Gulf coast with many rivers and estuaries where seawater pushed ashore by a hurricane could get trapped, said Hurricane Center Director Ken Graham. “This is a part of the Gulf of Mexico that is incredibly vulnerable to storm surge,” Graham said. Parts of Florida’s curvy Big Bend could see up to 12 feet (3.5 meters) of storm surge, while Michael also could dump up to a foot (30 centimeters) of rain over some Panhandle communities as it moves inland, forecasters said. Alabama Gov. Kay Ivey issued a statewide state of emergency today in preparation for the approach of Hurricane Michael. The storm is expected to cause wide-spread power outages, high winds and heavy rain in Alabama. Flash floods and tornadoes are possible. Parts of the state are under tropical storm watches or warnings. The state of emergency went into effect at 3 p.m. Ivey urged south Alabamians to prepare for the emergency immediately. With Hurricane Michael’s landfall on the Gulf Coast expected on Wednesday, officials in coastal counties were preparing for evacuations and emergencies. Gulf County officials issued a mandatory evacuation for all of Cape San Blas, all of Indian Pass area, Simmons Bayou, Highland View, and Windmark. Evacuations were also ordered for the City of Port St. Joe, all areas from St. Joseph Bay to Long Avenue; St. Joe Beach and Beacon Hill — Waterside of Highway 98. Franklin County emergency officials issued a mandatory evacuation for all non-residents and Wakulla County emergency officials plan to announce a mandatory evacuation for coastal and low lying locations by 8 p.m. Monday night.